Philadelphia is known for a lot of things: the birthplace of American independence, a sense of irony for being “The City of Brotherly Love,” and perhaps most of all, a comfort food haven. The famous Philly cheesesteak, hoagies, world-class pizza, and the “black and white” milkshake are all quintessential flavors, as is a long-standing treat: Tastykakes. If you’ve ever been to Philly, you’ve probably had Tastykakes. And once you’ve had them, you realize how special they are. Tastykake offers a wide range of freshly-baked snack cakes — similar to Hostess products, but not nearly as mass produced. Tastykakes enjoy such a cult following in Philadelphia that Philly expats actually have them shipped out to them wherever they happaned to have relocated. They are that seriously good! The thing is, if you’re on a diet, Tastykakes are completely off the menu. The recipe for a good Tastykake is plenty of indulgent sugar and mondo carbs — that is, until now! The Tastykake Sugar Free Cupcakes are a sugar free variant of a classic snack cake design: a decadent chocolate cupcake with a creme middle. What is so genius about Tastykake Sugar Free Cupcakes is that they manage to give you a moist crumb and chocolately cake, as well as a sweet cream filling with no harsh aftertaste. And at only 5 grams of carbs a serviing, you get a lotta Tastykake for your carb bucks. 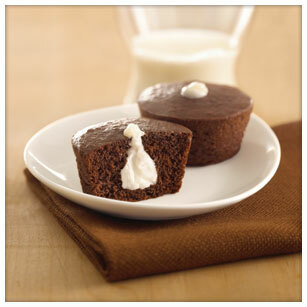 Ready to give Tastykake Sugar Free Cupcakes a try? We have them at Linda’s Diet Delites! Take a look! 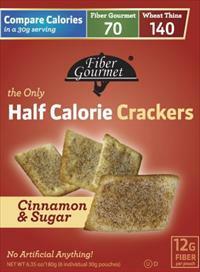 Fiber Gourmet Half Calorie Crackers – Low Cal & low Carb! Fiber Gourmet gives you the best of both worlds: a low calorie cracker that also doubles as a low carb snack! People often figure that their are either low calorie or low carb dieters. But in fact, you can also look to cut calories on a low carb diet and speed up your weight loss even faster. Dr. Atkins himself always admitted that low calorie diets do work — the problem with them is that you’re always starving while you are on them, and being hungry means that the diet is more destined to fail. That being said, if you can manage your low car diet by taking in less calories, it will only help you lose weight. And Fiber Gourmet Half Calorie Crackers can most definitely help you. Not bad, huh? The combination of light honey flavor with a hint of salt makes for an amazing treat. And considering that they come in three varieties — original, everything, and cinnamon/sugar — there really is something for everyone out there who is on a diet who is craving a crunchy snack. You’re probably wondering about the nutritionals by this point. Here they are: 10g net carbs per serving, 70 calories per serving, 4g protein, and Diet Count: 1/Diet Count Plus: 2. Are you ready to try Fiber Gourmet Half Calorie Crackers? We have all three varieties in stock at Linda’s Diet Delites! Take a look! Posted on January 22, 2012 May 9, 2013 Categories Diet Food, Food Finds, Low CarbTags 6 pack, Fiber Gourmet Half Calorie CrackersLeave a comment on Fiber Gourmet Half Calorie Crackers – Low Cal & low Carb! It is estimated that some 59 million people in the US suffer from a thyroid condition, many of whom may not even realize they have the condition. The thyroid gland is one of the biggest endocrine glands in the body and is the shape of a butterfly and located in the neck. Its purpose is to control how the body spends energy, makes proteins and how it reacts to hormones. It also produces the triiodothyronine (T3) and thyroxine (T4) hormones which control our metabolism. Most sufferers of thyroid conditions suffer from an under-active thyroid gland, or hypothyroidism, which can cause a range of problems including weight gain, low energy levels, sexual dysfunction, infertility, hair loss, anxiety and depression. An over-active thyroid or hyperthyroidism is much less common but can also make patients struggle to lose weight. People with both of these disorders often find that traditional low fat, low calorie diets not only don’t work for them in terms of weight loss, but in some cases can actually make their condition worse. People with thyroid disorders will typically find it extremely difficult to lose weight, but many have found that by sticking to a low GI or low carb diet they can effectively control their weight. Supporters of low carbs diets believe that people with malfunctioning endocrine systems can greatly benefit from the metabolic changes that a low carb diet brings about. The low carb diet’s ability to make the body burn fat without starving it of calories has helped many thyroid disorder patients to lose their excess weight. Some people however, have found that extremely low carb diets have been detrimental to their weight loss, as they have suffered problems processing the large amounts of protein they were consuming. Some patients with thyroid issues also found that they were consuming too many calories for there to be a positive effect on their metabolism. Many have found the South Beach, low GI diet more beneficial to them than the much stricter Atkins diet since it advocates lean meats and a wider variety of fruit and vegetables. It is important to note that no diet alone will help you lose weight if you suspect you have a thyroid problem, a low carb diet should be used in conjunction with prescribed medication and exercise and the advice of your doctor. Is a Thyroid Disorder Stopping You From Losing Weight on a Low Carb Diet? From a different angle, some dieters who already on low carb diets such Atkins, suddenly find that they are having trouble losing weight, or are actually gaining weight instead. We have found that quite often a thyroid problem is the reason for this. A thyroid disorder can happen at any time and as you age it becomes more likely. The thyroid gland suddenly stops producing enough of the hormones needed to regulate your metabolism. Where before you found you were making great process towards your goal weight on your low carb diet, suddenly the weight loss stops or reverses. Luckily hypothyroidism and hyperthyroidism are easy to diagnose. One way to do this is to track your temperature over the course of a few days. By taking your oral temperature four to five times a day over several days you can see what your average temperature is. An average temperature below 98ºF usually indicates an underactive thyroid; other symptoms of hypothyroidism include dry skin, brittle nails, hair loss, depression, lack of energy and insomnia. Your doctor will be able to test to see if you have the condition and give you the appropriate medication which should kick-start your low carb diet again. Primal dieting is becoming more and more popular among those looking to lose weight and improve serious health conditions, like osteoperosis. Read about the similarities and differences between primal and low carb diets. As you know, diet fads are a mainstay of modern culture; it seems that a new one springs up every year, and for a time, dominates the diet industry. Low carb and gluten free diets have proven to have longevity — mainly because they work — but the newest “fad” diet is actually one that has been used before — by primitive man. The so-called “primal” diet is becoming increasing popular among people who are looking to lose weight and even fight terminal diseases, like cancer. The primal diet was coined by nutritionalist Aajonus Vonderplanitz, and it focuses on eating high amounts of protein, little or no sugar, and raw foods that have not been cooked or otherwise processed through methods such as Pasteurization. Like the low carb diet, it has plenty of detractors: the medical industry continues to seek to destroy any revolutionary diets that seek to challenge the high carb, low calorie diet — even if a diet like the primal diet has been literally millions of years in the making!